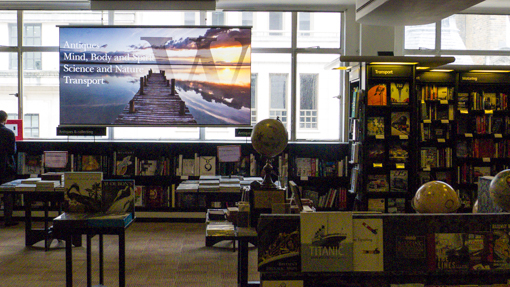 While I (Chris) was visiting JL in London, I wandered into Waterstone on Piccadilly. 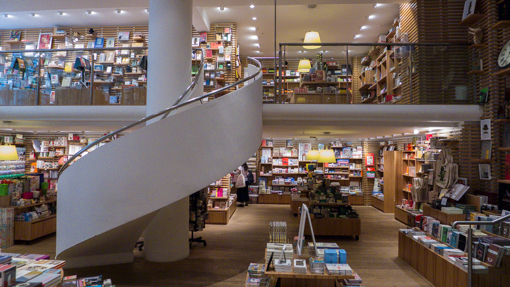 As some of you might have noticed on this blog, I like visiting bookstores and have been photographing them. If you want to see the other bookstores, just click on the tag bookstore on your left. Some of the information I have included here came from their website, click here. 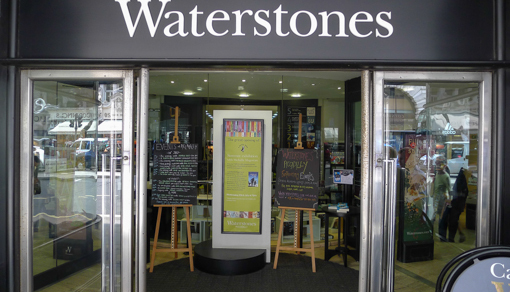 Waterstones Piccadilly is situated in the heart of London’s West End. 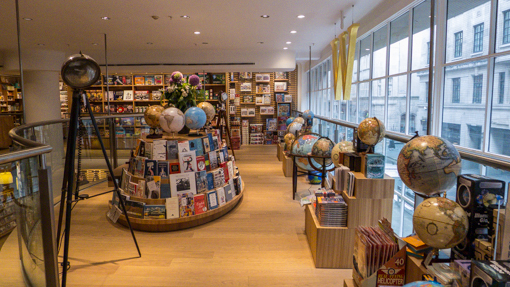 Now Europe’s largest bookshop, it was once home to the renowned department store Simpson’s; an admired landmark of London’s architecture, and the inspiration for the popular 1970’s British television programme ‘Are You Being Served’. When Simpson’s opened in April 1936 it was the largest menswear store in Britain. 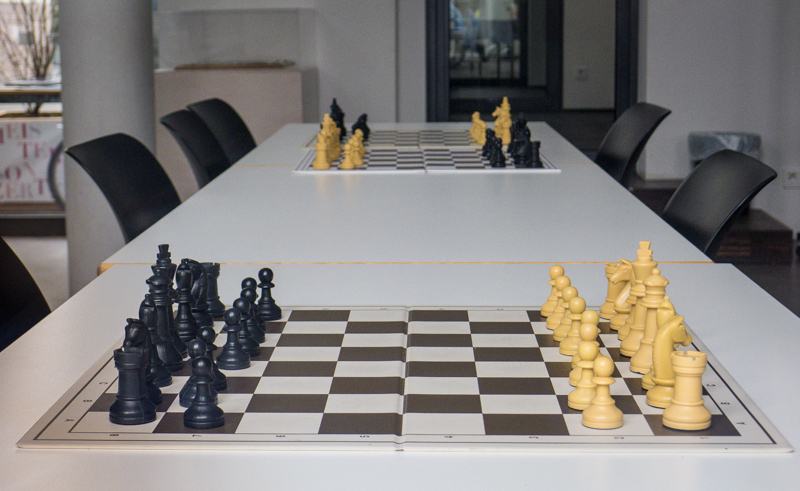 The design of the building is distinctly modern in comparison to the regular architectural style of the time. 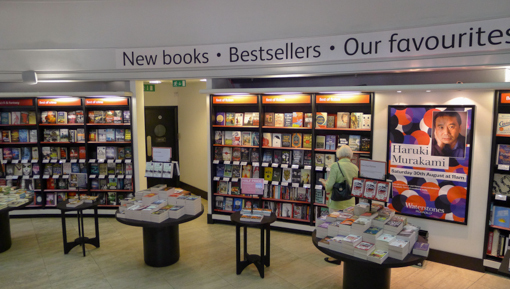 Waterstones Piccadilly opened its doors in September 1999 and has eight floors open to the public, six of which are dedicated to books. 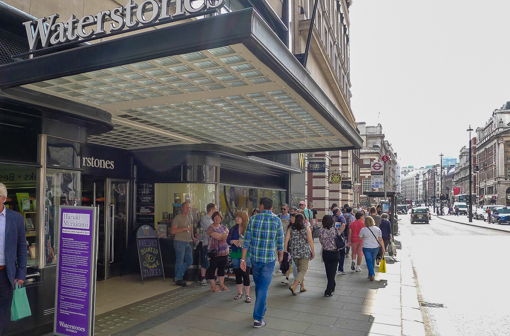 Waterstones claims to have 150,000 titles in stock and over eight and a half miles of shelving. 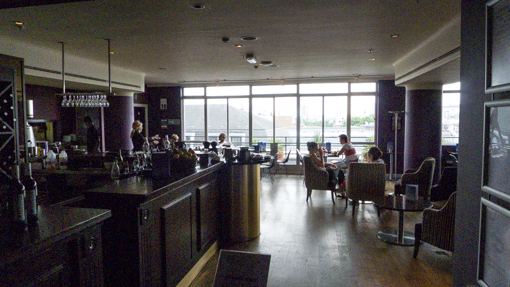 On the top floor is a quiet cafe/bar/restaurant – the 5th View Bar, open till 10pm! In years past, I arranged to meet people at the fountain at Piccadilly Circus or the now defunct Swiss Center at Leicester Square. If I live in London now, this could be an ideal alternative for the heart of West End. 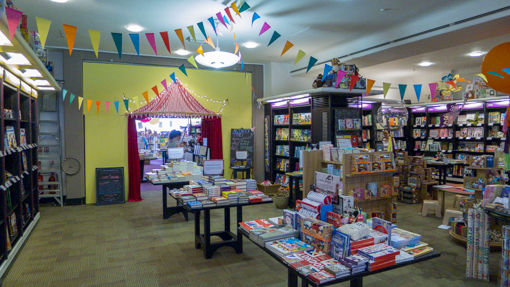 Every city should have a bookshop like this one. These are photos I (Chris) took and posted on Facebook. The series was started in March of 2013. 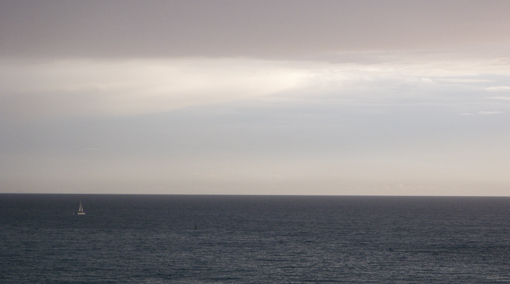 There is no theme – just something random and visually interesting. We gave each a title and noted where it was taken (to the extent we could remember the city). If you are interested to see other Random Photos, click on the random tag on the left. These are the photos I (Chris) took and posted on Facebook. The series was started in March of 2013. 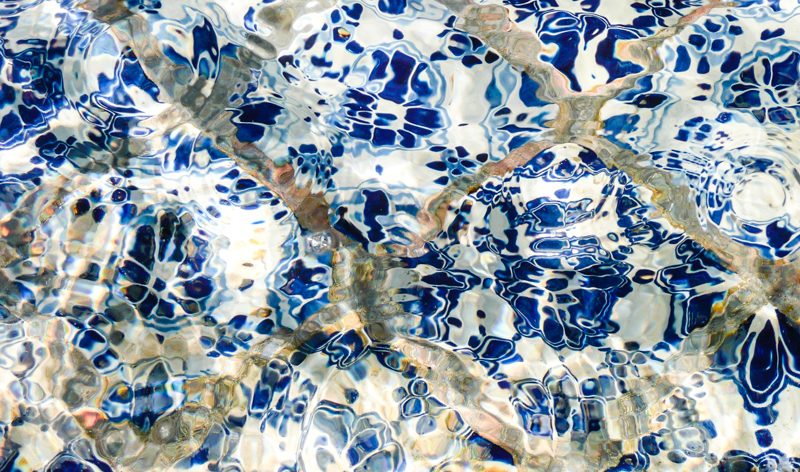 There is no theme – just something random and visually interesting. We gave each a title and noted where it was taken (to the extent we could remember the city). 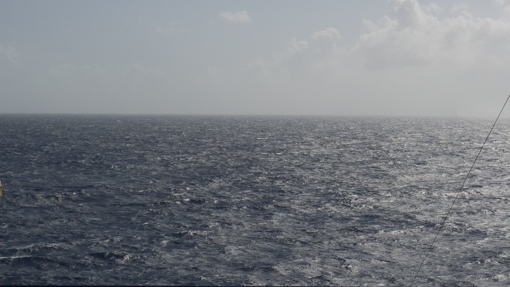 During Christmas 2013, we went on a cruise in the Caribbean. 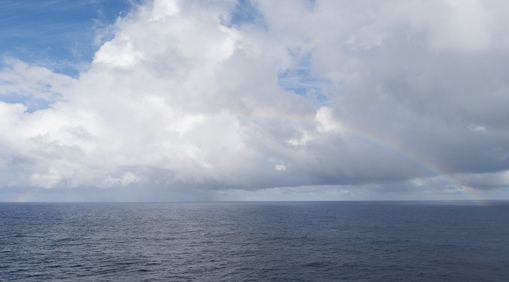 The sailing started from Miami and for 7 days, we visited several Caribbean islands. 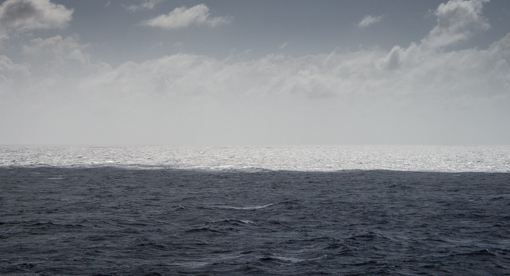 We also spent a few days at sea. 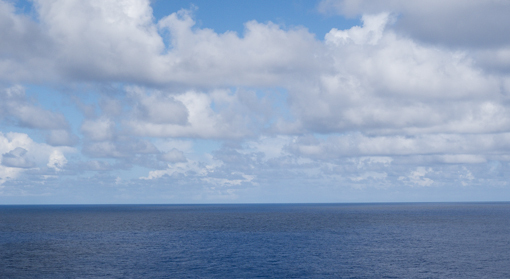 The only thing in sight, 360 degrees, is the horizon. 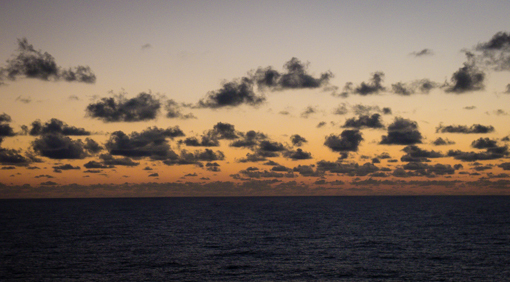 Here are some pictures of the horizon taken at different times of day and at various location on board and on shore. 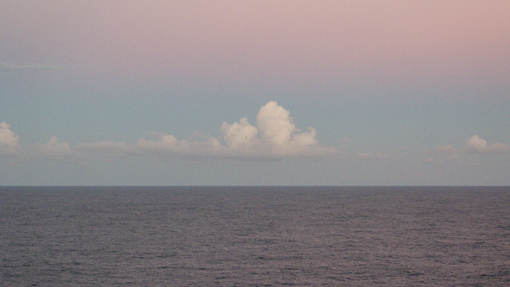 Beautiful and lonely … the horizon was what the explorers saw for months until (if they were lucky) they found an island or a continent. 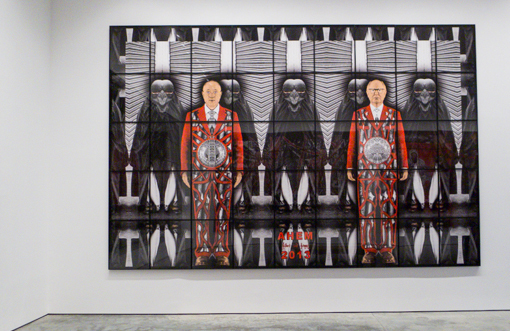 While visiting London recently, my (Chris’s) friend JL took me to White Cube at Bermondsey to see the latest exhibition by Gilbert & George. 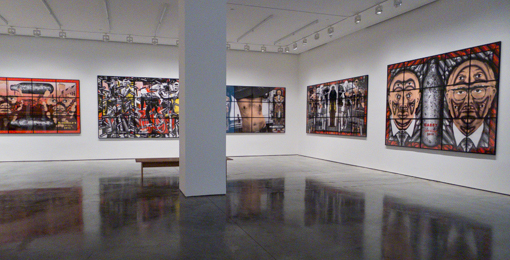 I have seen their works in the past but never so many in a gallery. 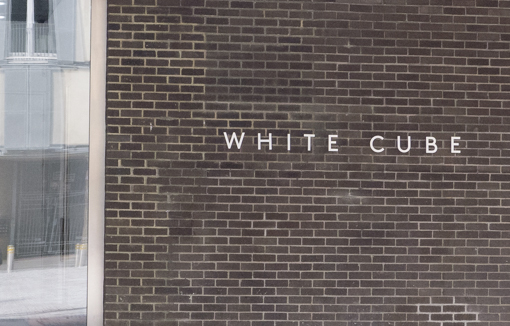 White Cube is a contemporary art gallery with two branches in London: Mason’s Yard in central London and Bermondsey in South East London, one in Hong Kong and one in São Paulo. White Cube Bermondsey opened in October 2011 and is the largest of all the gallery’s sites. 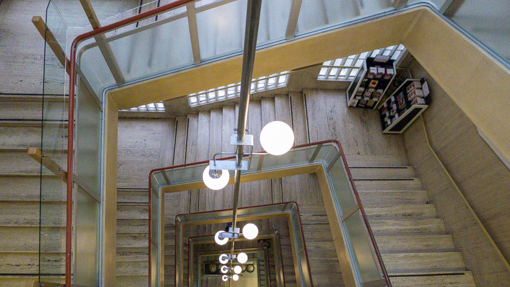 The building, which dates from the 1970s, includes not just galleries but also private viewing rooms, an auditorium and a bookshop. To me, the openness of the gallery entrance and the generosity of space inside creates a dramatic contrast with the old houses and narrow streets of the Bermondsey area. 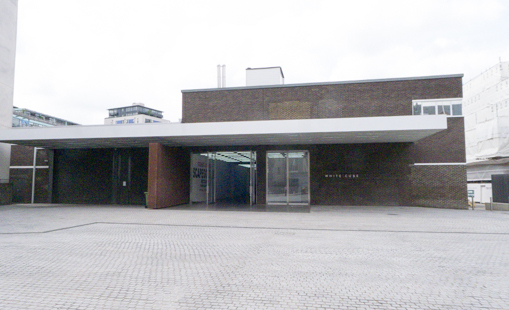 White Cube represents some big names – Damien Hirst, Andreas Gursky, Anselm Kiefer, Chuck Close … See their web site here. 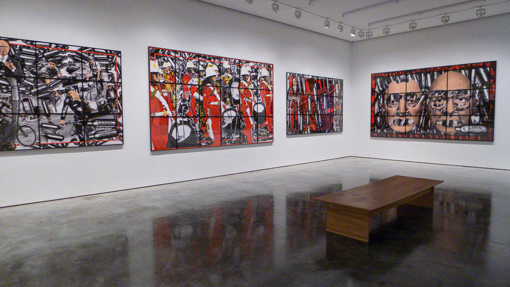 Much of what I say here about the artist came from Wikipedia and White Cube. 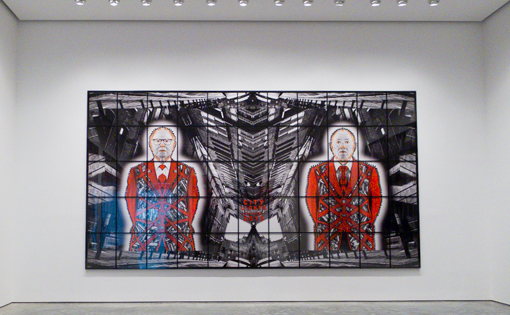 Gilbert and George worked exclusively from the 70’s as a single artistic unit under their first names. Their trademark format is the large grid, a square or rectangular picture broken into sections that becomes a unified field of signs and images. They frequently appear in suits in their work and are rarely seen in public without wearing them. It is also unusual for one of the pair to be seen without the other. I cannot help but think of the Pet Shop Boys. The colors (red, black and white) in this series of pictures and their somewhat robotic poses reminded me also of Kraftwerk’s The Man Machine. 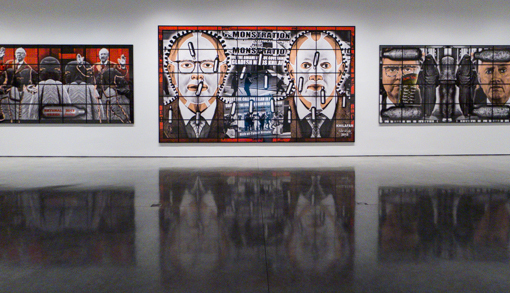 The backdrop and inspiration for much of their work is the East End of London where Gilbert & George have lived and worked for over 40 years. 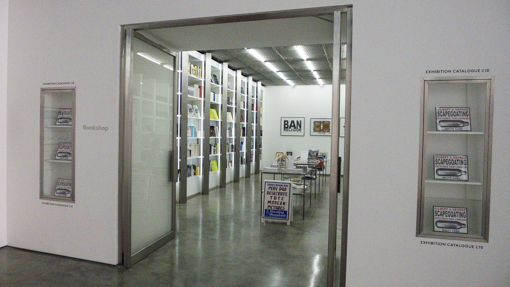 But some of their works are quite controversial, one can find them easily online – just do an image search. 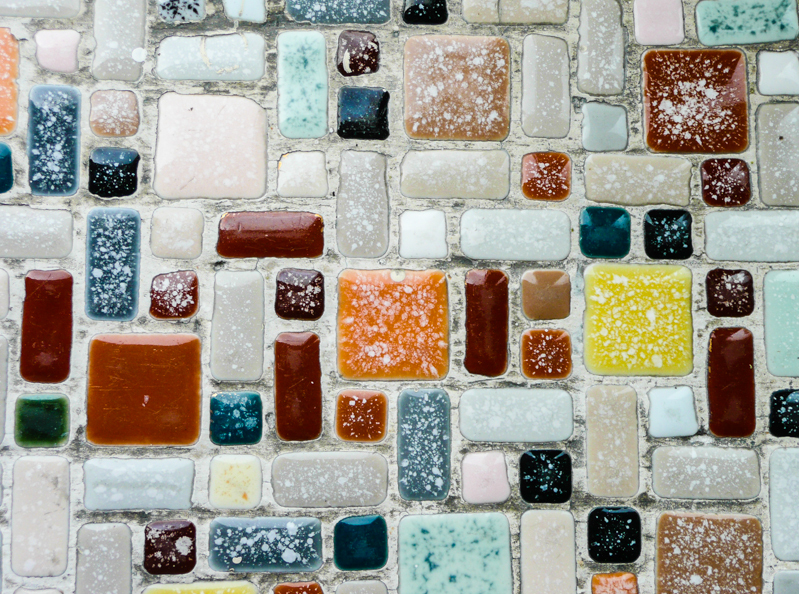 The work consists of three large panels, each containing 60 smaller square panels. Frequently featured in the works are images of the sinister bomb shaped canisters used to contain laughing gas (nitrous oxide), used recreationally. Gathered by the artists from the side streets and back alleys that surround their home, the presence of these canisters, mimicking that of ‘bombs’ pervades the mood of the SCAPEGOATING PICTURES to infer terrorism, warfare and a stark industrial brutality. 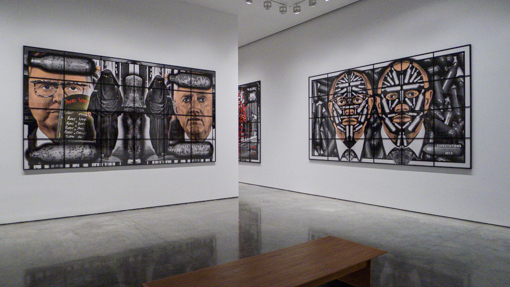 Overall, I think the setting and the scale of the works, Gilbert & George’s staring faces and the canisters, cloned images of middle-eastern ladies with their faces covered and the accumulation and superposition of words over images really worked to create a claustrophobic, almost-menacing mood. If you like G&G, this is a treat but it is unlikely to generate new fans. 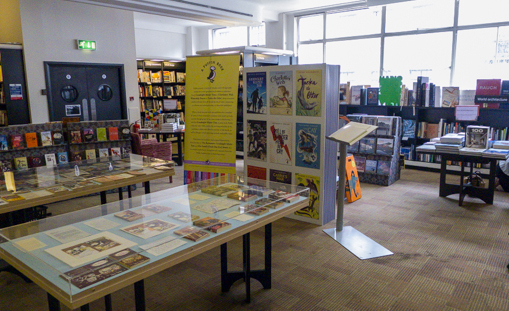 The exhibition is free and will continue until September. 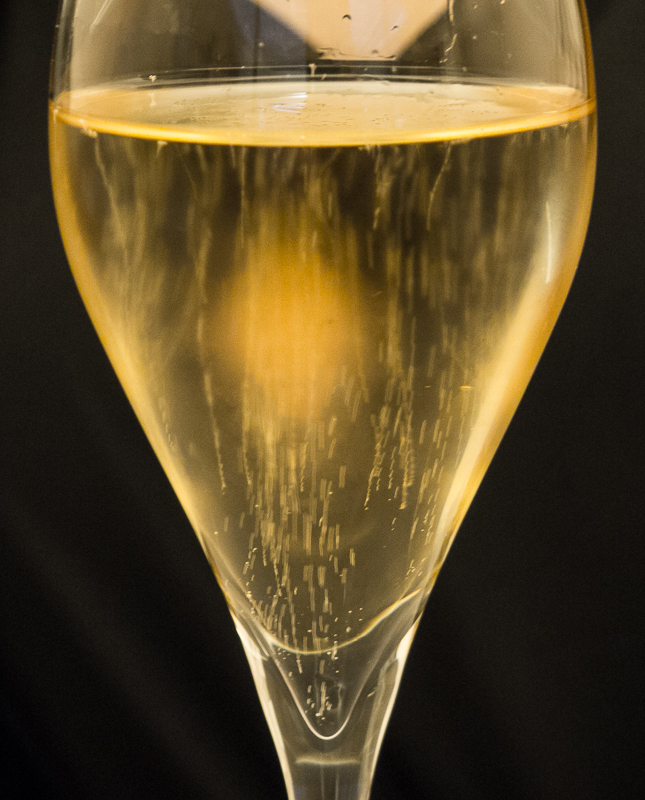 The first well-known lord was Christophe Thomas in 1313. 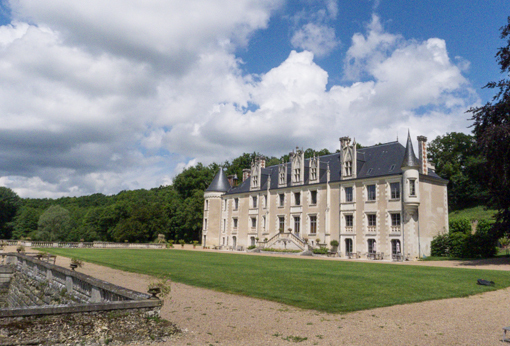 Around 1410, the chateau became the property of Jean du Bois, majordomo of the Duke of Guise. 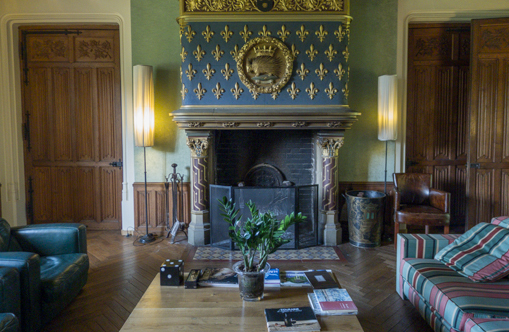 During 16th century, it became the property of the military, and then in 1612, Louis Charles d’Albert, Duke of Luynes, became the owner, and it is also where King Louis XIII was invited to dinner on the 20th of June 1619. 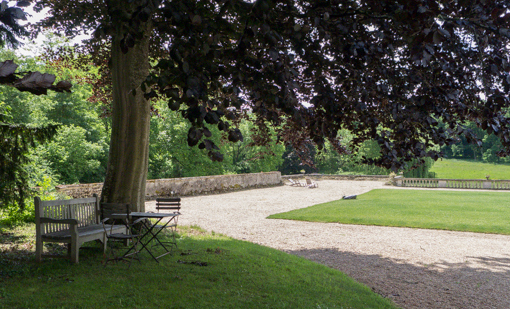 During the 17th century, the terrace was built on the walls that surround the moat and castle. The castle was restored in the 19th century. 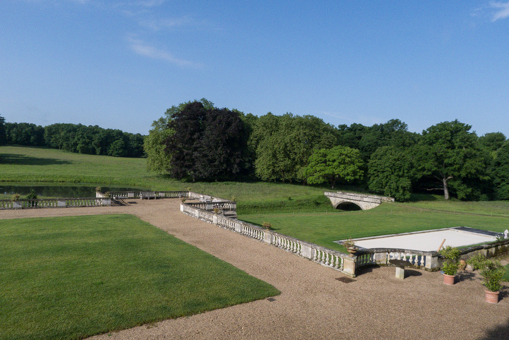 In the middle of a park of thirty hectares, the castle was entirely restored in 2007-2008. 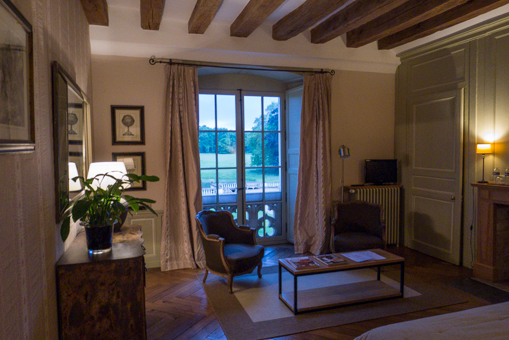 The chateau has a grand total of only 12 guest rooms. 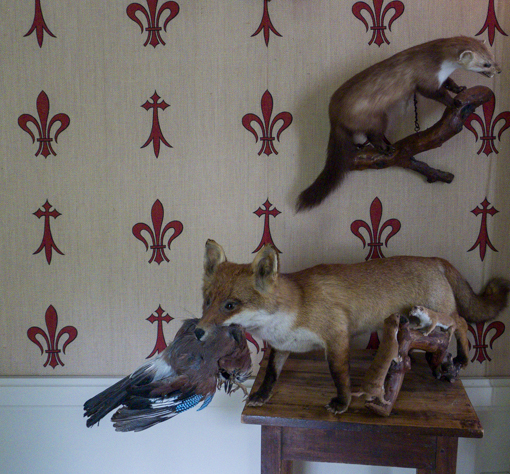 Like many chateau and manor houses in the area, for the nobles, hunting was the main activity. 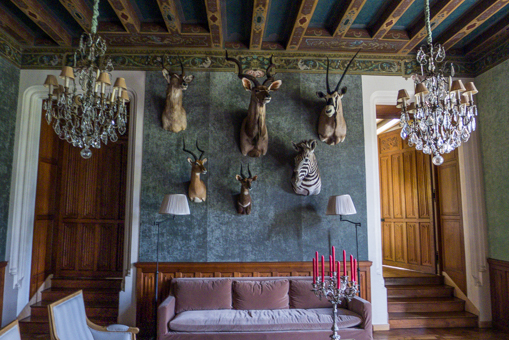 So the whole place is decorated by all kinds of hunting trophies. Some of these stuffed animals must look pretty scary at night. Despite the animal heads, no guns or weapons of any kind were displayed. 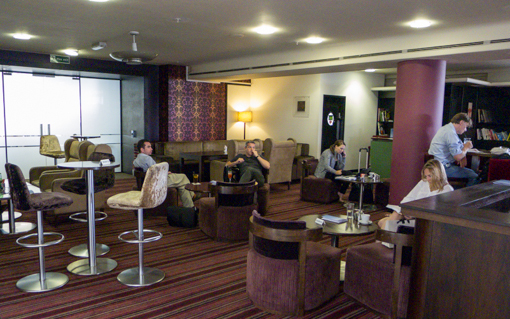 There is a “common” room on the first floor where drinks were served at certain times during the day and the guests could congregate to chat, play pool, and socialize. A large family of Americans were there when we arrived around 9pm the night before. 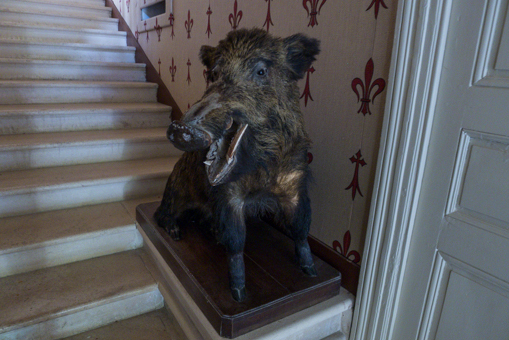 Above the fireplace, the metal emblem in the shape of an animal with a crown on its back is a porcupine. This animal seems to be the mascot or something of the place – there were more little sculptures of them lying around the room. This room on the ground floor was not opened. But it can certainly support some social functions. 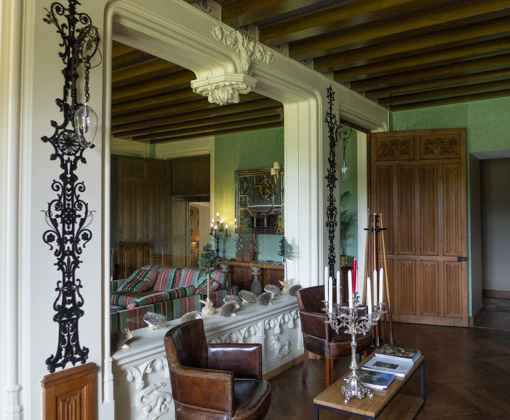 The chateau is a life-size Cluedo playboard, it could be a perfect place to host a murder mystery party. 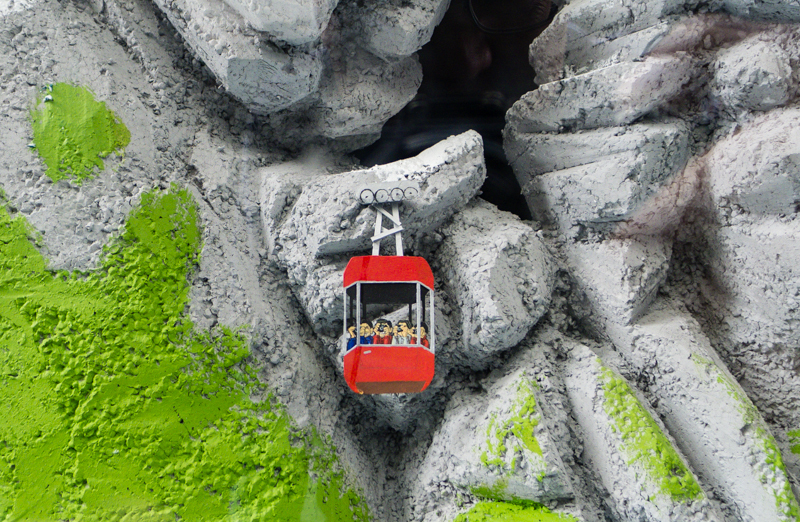 And the setting is authentic enough for something real to happen, given the right combination of people and motives. 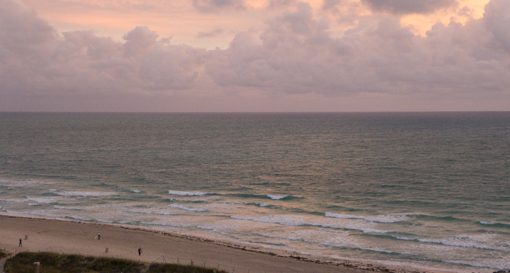 We met the owner who bought the property several years ago and now runs it as a hotel. The couple owns another property in the area where we also stayed, see later post. Except breakfast time when we saw the other guests, there was hardly any one around. How big is 30 hectares of land ? Where were the animals we saw the night before ? 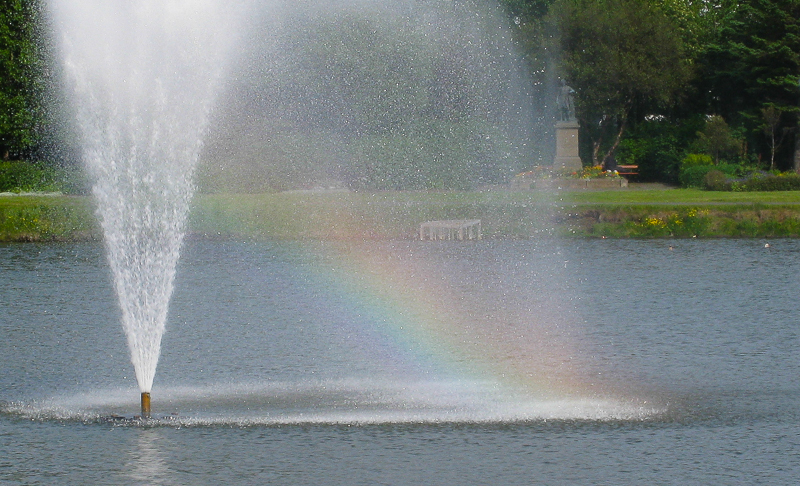 There is a stream running in front of it and a bridge that takes one to the meadow and the pond. Although we were there at the end of May, it was too early to open the pool. This outdoor space must be great during the long summer days. This is such an idyllic spot to linger, read a book, take a nap. 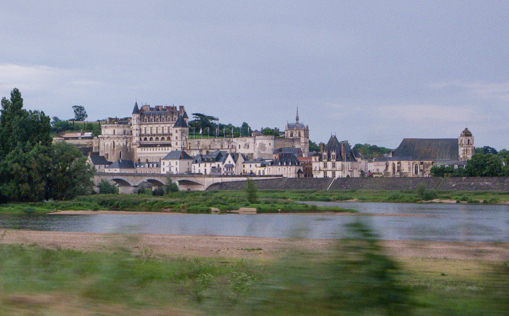 According to one of the guidebooks, it says that the Loire Valley has long been described as exemplifying la douceur de vivre (if we were in Italy, it would be la dolce vita). … “The overall impression conveyed by the region is one of an unostentatious taste for the good things in life.” We were curious as to what is being offered in this region to qualify such a statement. Voilà. 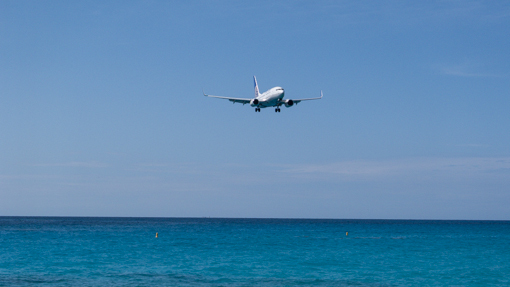 We hope to come back for a longer stay. 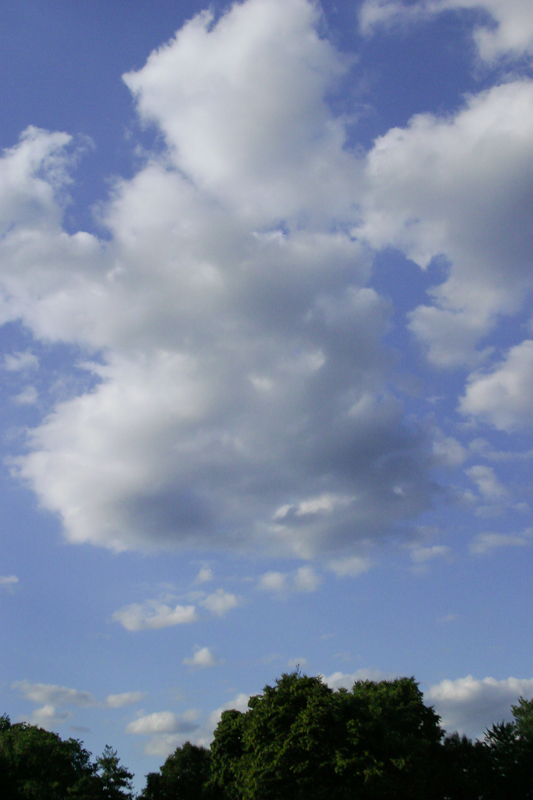 In mid-summer. 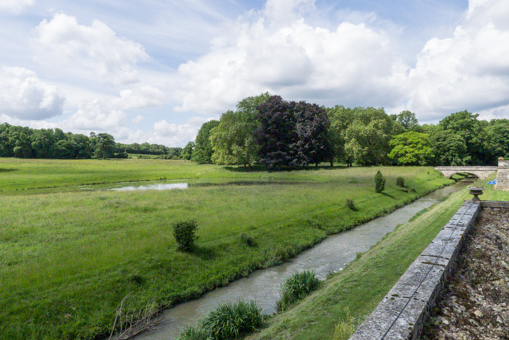 Continuing with our journey in the Loire Valley … after a few days in Saumur, we went up river to see the chateaux that made the area famous. 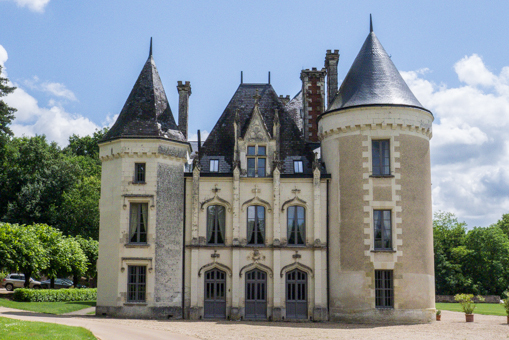 In the countryside around the city of Tours, we visited several chateaux that are justifiably France’s national treasures and deservedly tourist magnets. We will share those pictures in later posts. 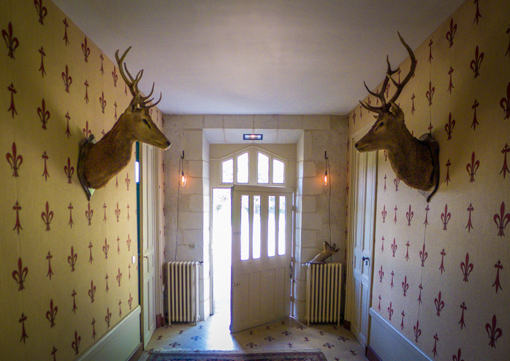 As many of the smaller chateaux have been repurposed as hotels or bed-and-breakfast, we decided to book a room at such an establishment. 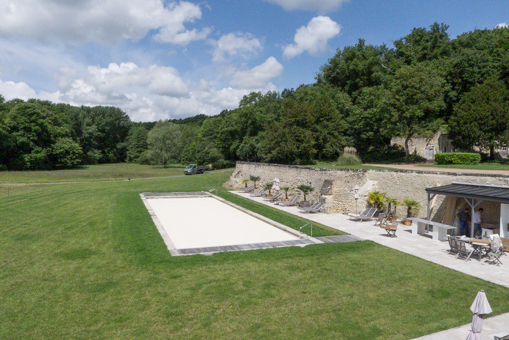 Originally we made a reservation at Château du Paradis through Booking.com. We chose it because it had good reviews and was situated in the middle of a forest. 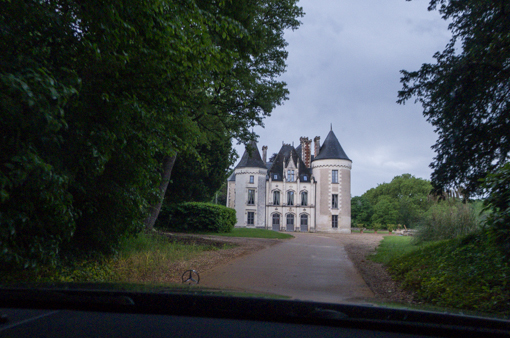 After having slept in a cave (see earlier posts here and here), we wanted to try a château in a forest. Big problem ! We did not realize this place requires that the guests arrive before 8 pm. 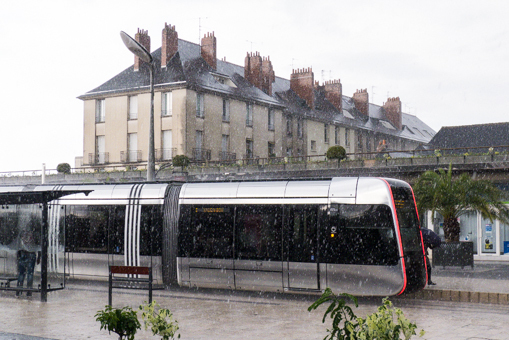 The owner called us while we were having dinner in downtown Tours (after a totally unexpected but spectacular hailstorm). He canceled our room reservation and volunteered to book us into a similar establishment nearby. He did not charge us because someone was waiting to take our room. This turn of event was a little disaster in the making. Apparently, the notice about the early check-in was in the original web page when we booked, but it was hidden behind a link and not in our email confirmation so we forgot/missed it when we were on the road. Booking.com need to make such special requirements more prominent in their paperwork. We really did not have a choice at that time. 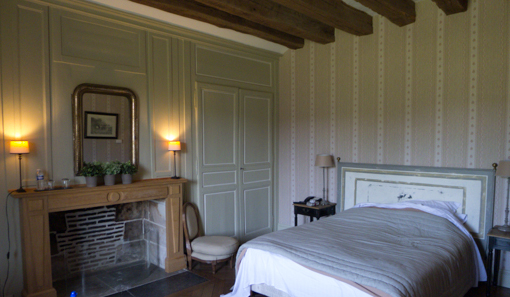 So we accepted without knowing what the place looks like except reassurances from the owner of the Chateau du Paradis. 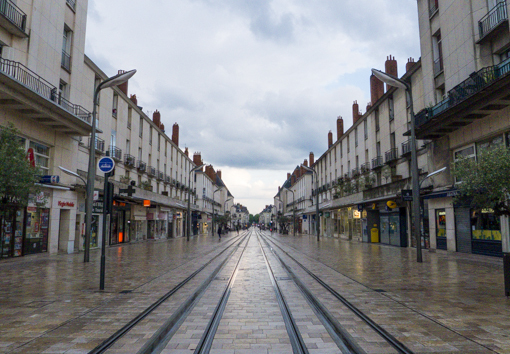 We finished our dinner quickly and started heading towards Amboise looking for a chateau for which we have only the vaguest directions – go to Saint–Règle. Any more detailed address is useless in the countryside. Fortunately, the place was not that difficult to find. 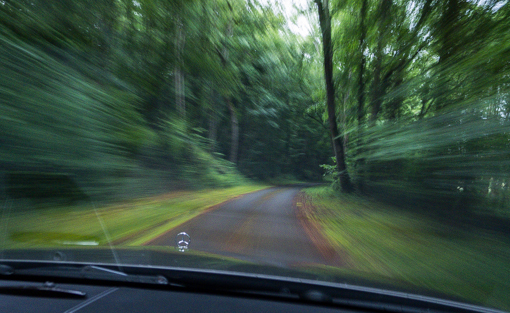 After turning off the public country road, we drove on a partially paved road for about 5-10 minutes before coming up to a gate. Et voila. Given the circumstances, we lowered our expectations. But we were pleasantly surprised upon arrival. 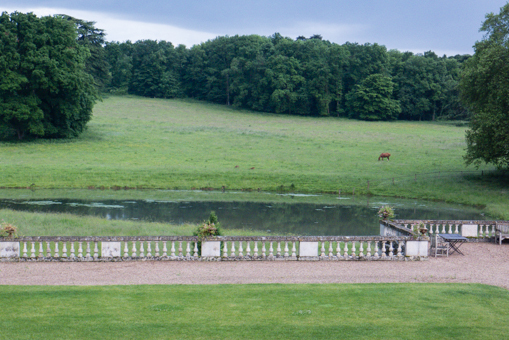 The room afforded us this view out of the window including a horse in a meadow. Very calm and relaxing. 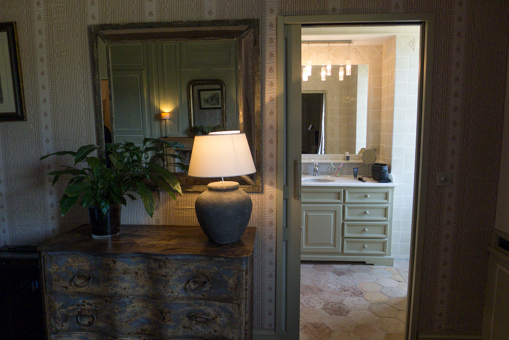 The room had a distinctly home-y feel which was welcoming. It even had a working fireplace. It was a relief for us after the surprise and panic, and allowed us to rest after a long day of sightseeing. 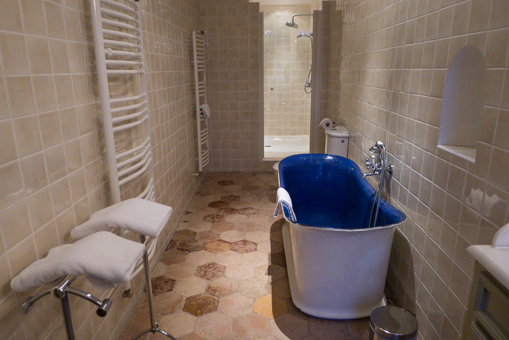 More pictures of Chateau des Arpentis to come. 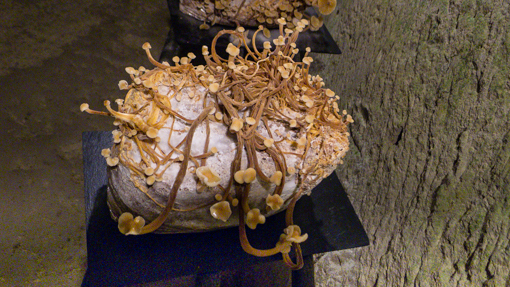 Continuing with our journey into the caves of Saumur … People in the area did not just live in caves, they use it to store wine and to grow mushroom. See earlier post here about the museum. 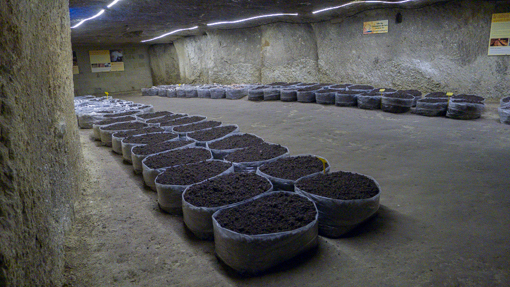 The caves provide an environment of high humidity and constant temperature that is perfect for growing mushroom. 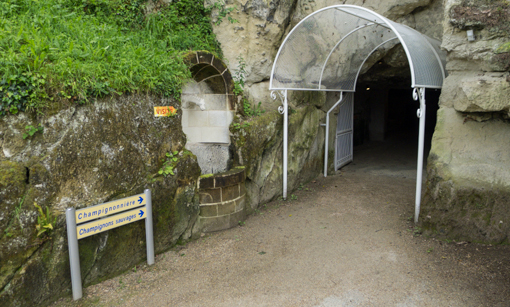 Many of the caves were once part of a quarry. 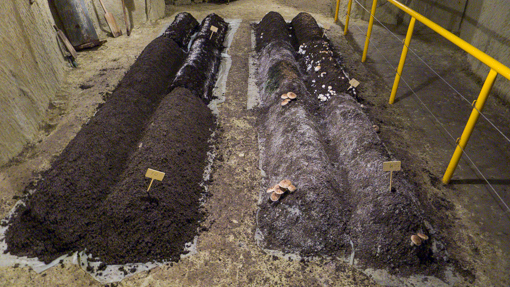 This facility at the museum produces four types of mushrooms commercially: white or brown button mushrooms, shiitakes, oyster mushrooms including the yellow pleurotes and blue foot mushrooms aka blewits (something new for us). Using a plastic culture bag is the preferred way, as it is more flexible and prevents the spread of pests. 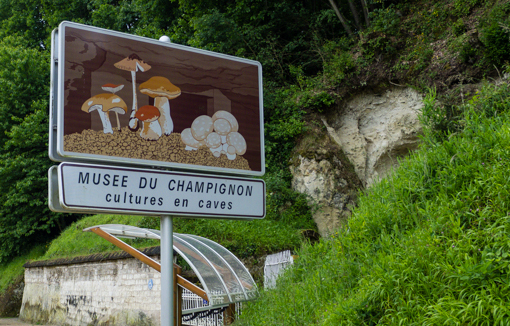 The white button mushroom or champignon de Paris (Agaricus bisporous) were first cultivated in the disused quarries in the Paris region, and then in the late 19th century, they moved to the Loire Valley. Apparently, more than half of the mushrooms cultivated in France come from this area and Anjou (just a bit downstream of the Loire river). 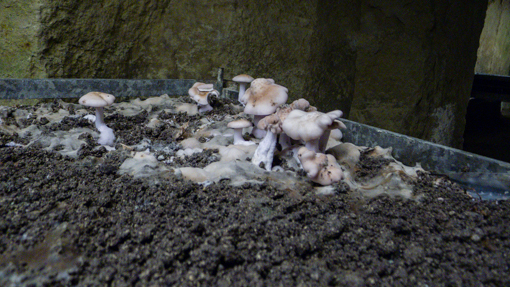 The facility aims to provide ample ventilation (otherwise the mushroom will become deformed ! 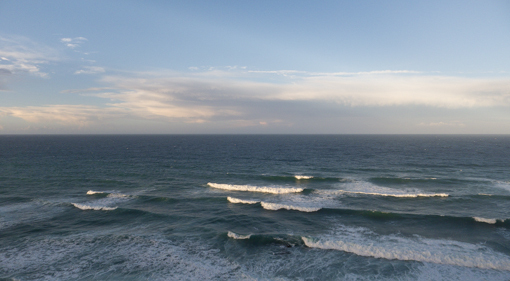 ), temperature at 10 to 18 degrees celsius, 14 degree being the optimal, and 85 to 90% humidity. 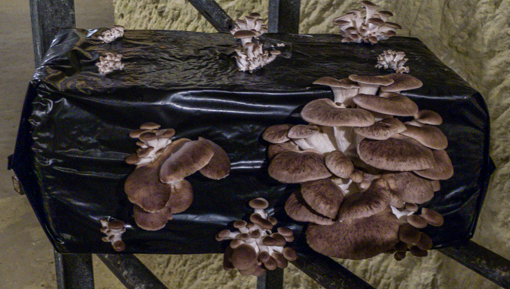 Shiitake or 冬菇 (Lentinus edodes), also known as black mushroom or oak mushroom, are grown in the caves on substrates that were hung and resembled tree trunks. 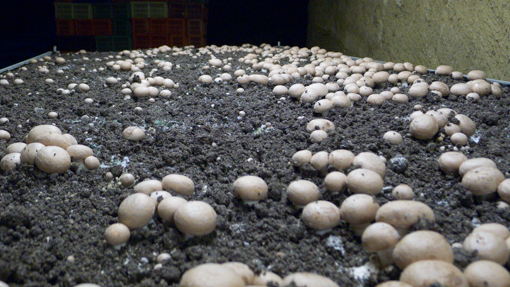 Apparently, they are slow growing and do not appear until 2 to 5 years after inoculation. The growers stimulate growth by exposing the culture to shock, such as sharp change in temperature, mechanical vibration (including artificial thunder ? That’s what it said on the explanatory notes on the wall) or soaking in water. 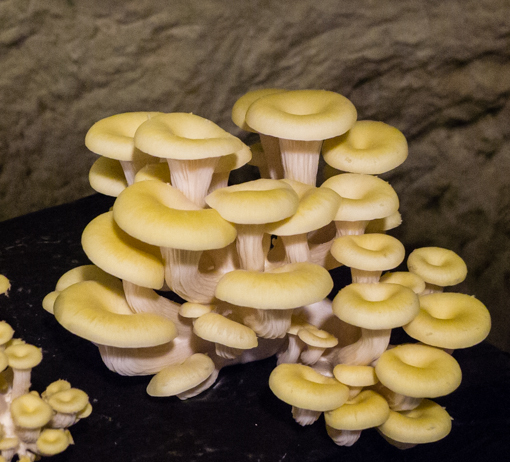 Pleurotus ostreatus or 蠔菇, the oyster mushroom, are mainly cultivated in large polyethylene bags stuffed with hay, sawdust, wood chips, etc in layers, and spawn sown between these layers. 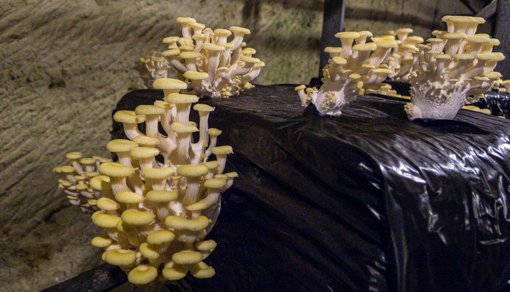 Pleurotus citrinopileatus, the golden oyster mushroom (tamogitake in Japanese) is the other type of pleurotes that are grown in this facility. The last type of mushroom cultivated here is Clitocybe nuda (also recognized as Lepista nuda and Tricholoma nudum, commonly known as the wood blewit or blue stalk mushroom). We know nothing about it. According to Wikipedia, it is an edible mushroom, found in both coniferous and deciduous woodlands. 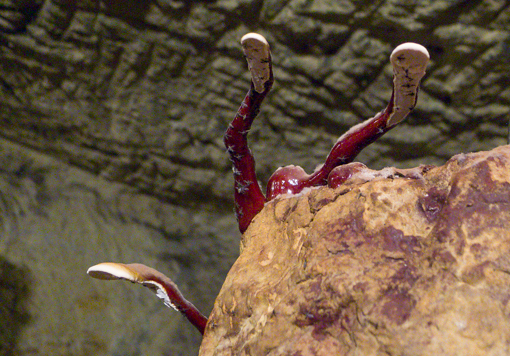 It is a fairly distinctive mushroom that is widely eaten, though there is some caution about edibility. Nevertheless it has been cultivated in Britain, the Netherlands and France. … Blewits can be eaten as a cream sauce or sautéed in butter, but it is important not to eat them raw, which could lead to indigestion. They can also be cooked like tripe or as omelette filling, and wood blewits also make good stewing mushrooms. They have a strong flavour, so they combine well with leeks or onions. 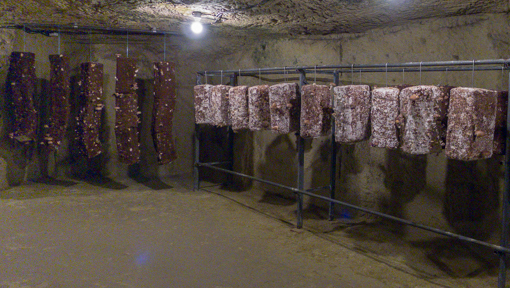 They were not in season or something … as this is all I could find in the tunnels. Back to sunshine, the museum shop offers freshly picked mushroom for sale or as a snack. 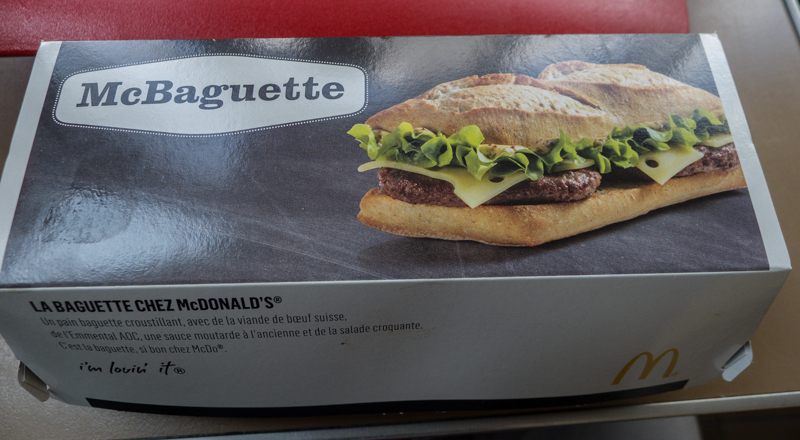 If it was our last day before heading home, we would have bought some. It was an interesting and unique visit. 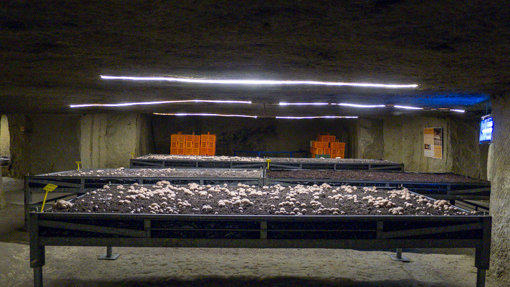 People in the area did not just live in caves (see our hotel in caves here and here), they use it to store wine and to grow mushroom. 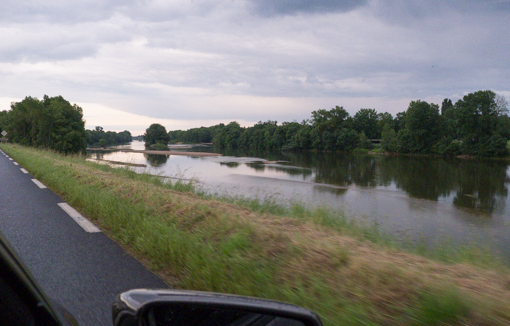 Apparently, more than half of the mushrooms cultivated in France come from this area and Anjou (just a bit down river). 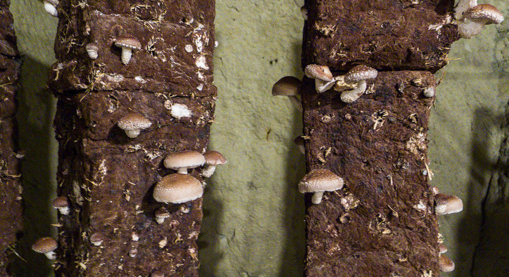 We went to a museum of mushroom which has a production facility attached to it. 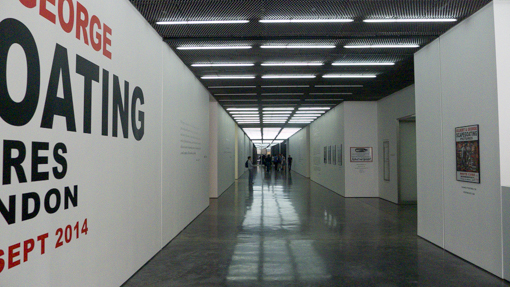 The museum part was quite boring. 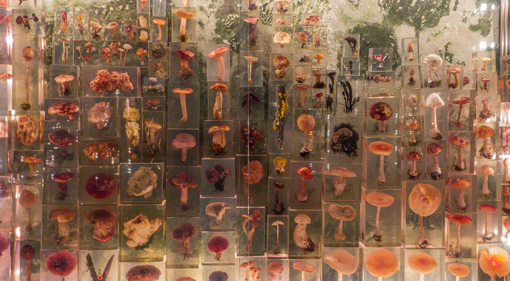 It started with collections of objects that are mushroom shaped – essentially anything that has a cap and a stem. 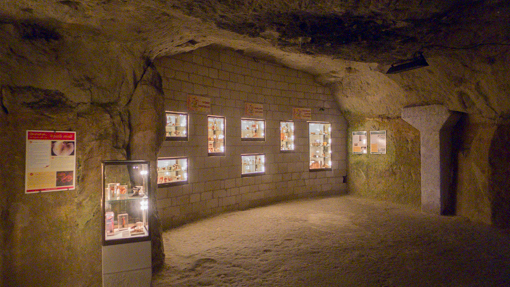 The other part of the museum, just inside the entrance of the caves, shows samples of different kinds of fungi preserved in plastic. There were lots of text accompanying the exhibits to educate the public about the varieties, as we all know, many of which are poisonous, and some are hallucinogenic. Many people here enjoy country walk, mushroom picking and then eating their harvest. Some toxic mushrooms look just like the normal pale white innocuous boletes type but can kill or at least send people to the emergency room. My friends told us that many villages have a local expert who can recognize the toxic ones, and people are encouraged to show their pickings to the expert before eating it. The really interesting parts start deeper inside the caves. 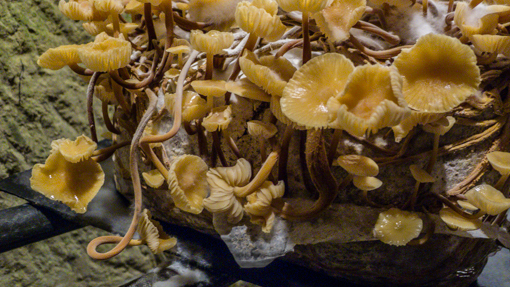 The museum keeps a small collection of live fungi beside those cultivated commercially. 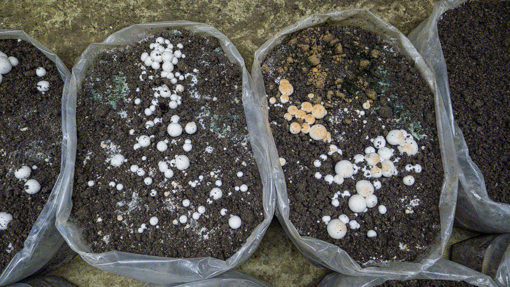 Below is black poplar mushroom – Agrocybe aegerita, a species that is really easy to cultivate, even at home as a hobby. This is Coprinus comatus, the shaggy ink cap, lawyer’s wig, or shaggy mane, a common fungus often seen growing on lawns, along gravel roads and waste areas. According to Wikipedia … The gills beneath the cap are white, then pink, then turn black and secrete a black liquid filled with spores (hence the “ink cap” name). This mushroom is unusual because it will turn black and dissolve itself in a matter of hours after being picked or depositing spores. 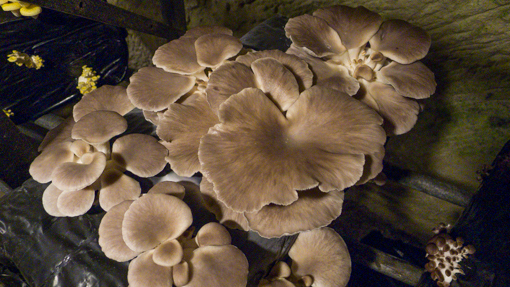 When young it is an excellent edible mushroom provided that it is eaten soon after being collected. 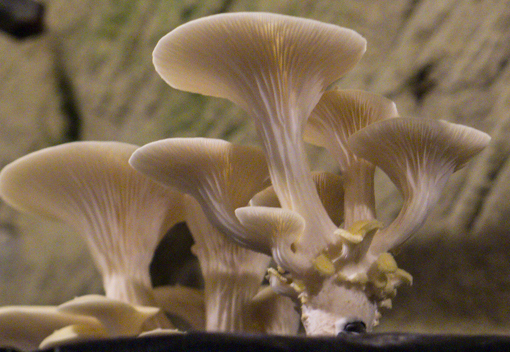 Hericium erinaceus or 猴頭菇 (monkey head mushroom) is a choice edible when young, and the texture of the cooked mushroom is often compared to seafood. 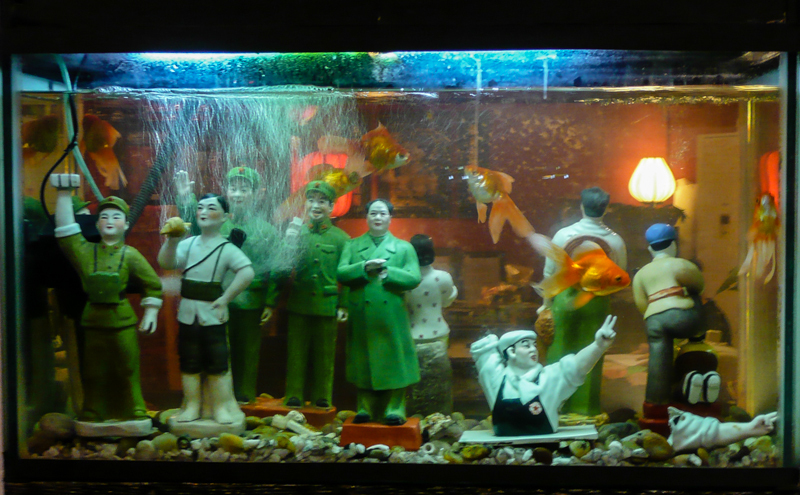 It often appears in Chinese vegetarian cuisine to replace pork or lamb. I have never heard of it let alone eat it. 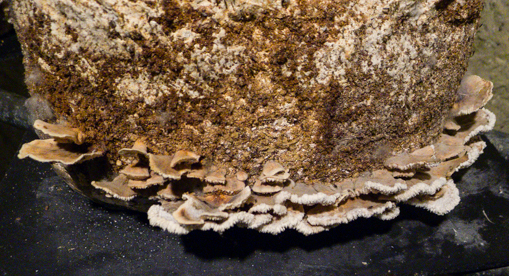 Trametes versicolor – turkey tail fungus – too tough to eat but believed to have anticancer properties. 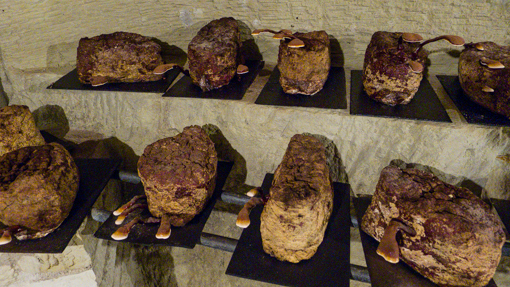 Each species has a unique requirement of substrate (wood, compost, etc) and temperature and humidity (essentially the natural environment of the caves). We forgot the name of this species. One of the more bizzare-looking species is lingzhi (靈芝) or reishi (Ganoderma lucidum) which is well known in Asia as having medical properties and a symbol of good fortune. They look like strange tongues or paws reaching out from a block of wood or rock. I (Chris) have not seen a living species before. Even if I did, since it has that shiny sheen and smooth surface, I would have thought that it was a cheap plastic model of the real thing. The top and white tip were covered in a fine layer of spores. 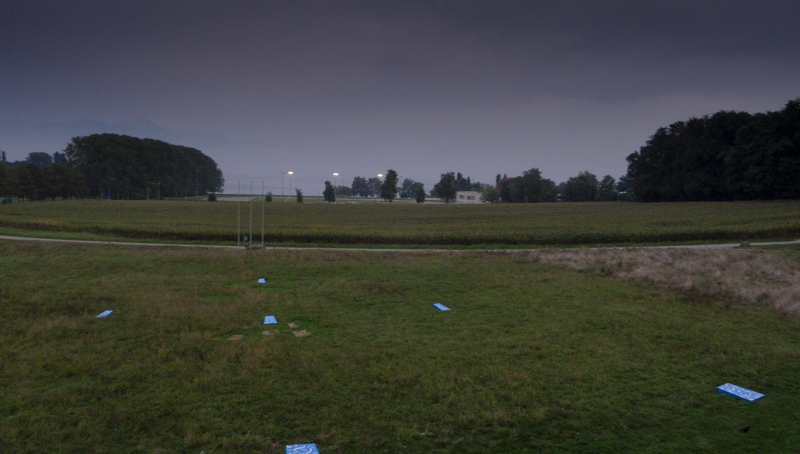 In our next post, we will show photos of the cultivation areas.